Dream Date is a 5 reel and 243 ways to win Microgaming slot with its target audience being ladies. Here you get to play pretend as a hot eligible female looking for an even hotter date. There are 4 dream dates on the reels and they’re all men. In your hunt for the perfect man, you’ll sample some exciting features like a Free Spins feature where you get up to 16 spins, the Hot Zones feature which gets a date to give you a cash prize, wilds and more. It’s possible to win up to 1,800x your stake on every free spin. Start your stakes from 15p to £60 per spin on any desktop or smartphone device. Microgaming is one of the oldest players in this industry seeing as the company was formed way back in 1994. Back then the online betting revolutions was a far off dream so the company strived to provide quality gaming solutions. Their first casino launched in 1994 still uses the same Microgaming software to date. That’s more than 2 decades of quality that is an amazing achievement by the brand. Its time served in the industry can be viewed as both a blessing and a curse. The latter being that they’ve managed to distinguish themselves as experienced and knowledgeable and the curse being that a lot of their slots have already come of age. 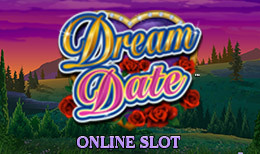 In this romance themed slot, players can choose either a historic or modern mode. It isn’t the best looking slot out there especially for Microgaming. The historical era mode transports you to the 19th century and if you’re a fan of Jane Austen, you may feel a familiar vibe here. The modern era mode takes players to a city landscape. Both of the two have 4 dates and you choose the Dream Date icon which is the highest valued symbol. It pays 25x your stake when you land 5 of them on a payline. Wild symbol- The heart is the wild and can substitute for all the other symbols except the scatter. It pays the highest amount of 50x your stake when you hit 5 on a payline. Hot Zones feature- Hot Zones appear in the reels between the 1st and 5th If you land any of the dates or the lady in the Hot Zones, you win a cash reward as much as 40x your stake. If you land both of them at once, not only do you get a cash reward but a Free Spins feature as well. Free Spins feature- This can be activated by landing 3 or more scatter symbols anywhere on the reels. It gives you 8 free spins. If you land 3 scatter symbols with a Dream Date and Hot Zones, you get 16 free spins. The Dream Date symbol transforms into a wild during the feature if it lands on the reel at the middle and expands to give you a wild reel. Any wins formed at this point end up doubled. You will find that Dream Date gets rather simple once you begin spinning the reels. With a few plays you will also be able to learn some hacks- like how getting the chosen Dream Date symbol within the Hot Zones grants you access to the Free Spins feature. The slot has a medium variance. Players can win up to 1,800x your stake on each free spin where the 2x multiplier comes into play.